Each day our two primary forecast models get a little closer together on the prediction for snow (or rain) Sunday night…and there’s still a lot that could change over the next 48 hours! With today’s model runs, the NAM has joined the GFS with the primary precipitation event expected Sunday night into Monday morning. In fact, the expected preliminary event Saturday night night now looks to be a bust…nothing more than a dusting appears to be the best case scenario now. If nothing else, the Saturday night system should serve to moisten our very dry atmosphere so that Sunday night’s system should have no problem with moisture supply. That said, what kind of moisture should we expect? The NAM model has warmed since yesterday. If it proves to be correct, the majority of the upcoming storm will probably be rain with a late night change to snow. That would keep snow accumulations low – probably around an inch. On the other hand, the GFS keeps us firmly in the colder air. Possibly a little rain to start, but snow after that. This, of course, favors a larger accumulation – it still looks as though we have the potential for a 2″ to 4″ snowfall! Temperatures should be right around 32 degrees (plus or minus a degree or two) so it’ll be a sloppy wet snow (good for snowballs and snowmen). Accumulations will be highest on grassy areas, but (since it’ll be mostly at night) roadways will get their share too. As to which model is going to be right (or, at least, the closest to right), I don’t know. Years of experience of working with both models has given me this generalization – from 0 to 36 hours the NAM is usually equal to (or better than) the GFS. Beyond 36 hours, the GFS is almost always better then the NAM. So snow lovers, the situation looks good for Sunday night…but a lot can happen in 48 hours. Stay Tuned! Yesterday, I showed pictures of a full 180 degree rainbow (my first ever) taken near Vigo Spain. 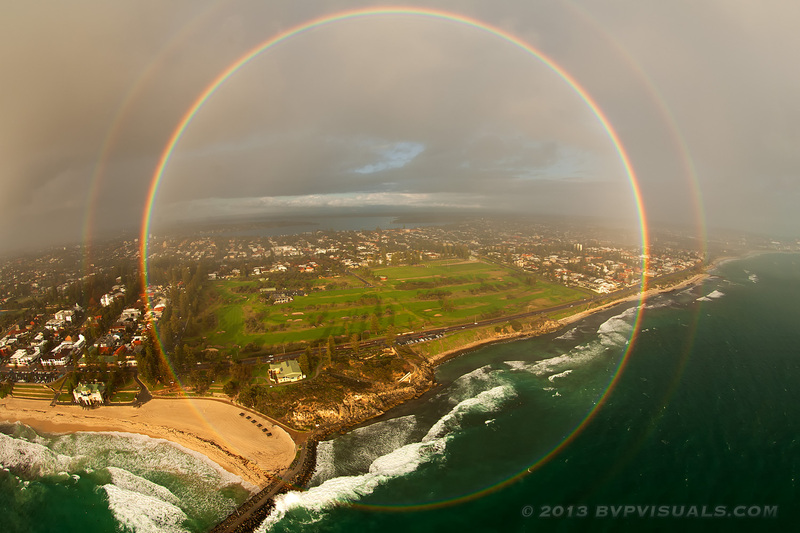 That brought to mind a picture I had seem of a full 360 degree rainbow – you can see them from the air above. Here’s one from Perth Australia. Fun Fact: Damascus Syria is the believed to be the oldest permanently inhabited city on Earth. Evidence dates back to a settlement as long ago as 8,000 to 10,000 years B.C. This entry was posted in forecast, stuff on November 14, 2014 by wx.